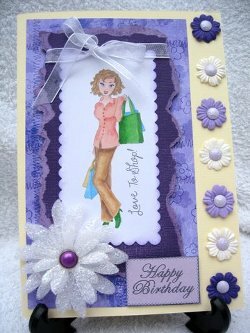 Card-making with recyclables can save you money, and use up those scraps, or other objects that you would otherwise have thrown away. It will make you look at things from a different angle before you decide to ditch them. Here are some ideas for the things you can use. Take the ribbons and pieces of lace off parcels and old clothes or bedding,and once they are washed and ironed they can be re-used. Small tassels can look stunning on a card too. Remove the buttons from old clothes and save them for future use. I have...er had... a lovely cerise pink cardigan that I ruined in the washing machine, but the satin buttons on it are untouched. So all was not lost. Save the wrapping paper from Christmas or Birthdays and keep it safe. Remove it carefully and keep it for that inspirational moment. Large pieces of paper may have elements on it that you can decoupage. Use pretty card that you have, and cut it into heart shapes and add them to your creations, using foam pads. Make tags out of them to attach to other parcles. Use pinking shears to pretty up the edges. Keep the acetate packaging that comes with equipment, it makes lovely windows in aperture cards. Keep the translucent wrappers from the chocolates you scoff at Christmas, and smooth out the foil wrappers too. Place them behind small apertures and stick in place with double sided tape. Stamp an image on it, maybe a scroll, snowflake or text, with black "StazOn"
There are endless things around your home when you're card-making with recyclables. Recycle tin foil. Die cut circles of different sizes and add them to the front. 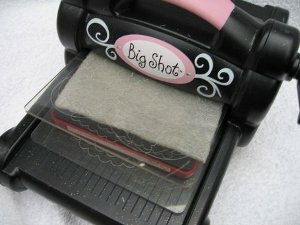 Or use an everyday hole punch for smaller dots. Use it to give a mirror effect. 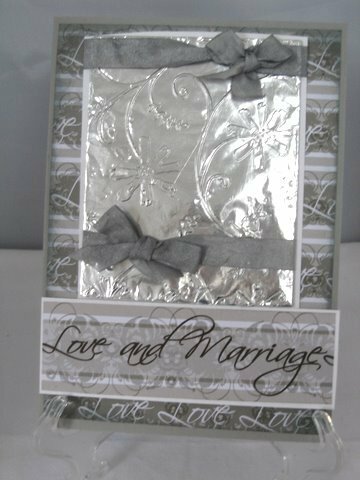 Emboss the thicker tin foil and use as a panel on your creations. This card was made using tin foil as a panel. Fold the tinfoil three or four times to make a thick pad and then roll it throw your die cutter in an embossing folder. This seam binding has been made to match my scheme by colouring it. Try die cutting a cork tile into bows, stars or flowers. Use a strong glue to attach them. Or make your own stamps from them and have some fun. Shape bits of wire into flowers or hearts, or stems but work carefully with it, we don't want any accidents. On this card, made just for fun, I have used wire for the stems, and a sliced bottle cork in the centre of the paper flowers. All have been attached with silicone, tucking the ends of the wire into it for safety. Or maybe you want to thread beads onto the wire for a pretty efect. Use the wire to attach charms, or wind thinner wires around panels before gluing them in place. Shape it into scrolls and thread your ribbon through it. Special frames can be purchased to wind the wire around, into a variety of different shapes. And round nosed pliers will help you to bend the thicker wires. The wire comes in all thicknesses and colours so experiment to match your scheme. 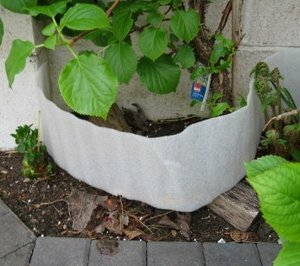 This piece of flotsam was blown into my garden and wedged under the flower bush, on investigation I wondered what I could do with it. So card-making with recyclables is ever at the front of my mind, rather than waste this little gem. ... and this is what I came up with. 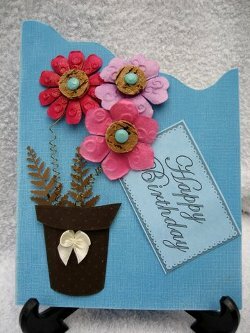 Now when they are glittered up and joined with a brad, it will make an unusual flower for a card. To some it was just an old piece of packaging but look outside the box and re-invent it for your self. The piece that is left will make some lovely snowflakes for Christmas cards, and one things for sure...nobody else will have the same thing! Try card-making with recyclables and it could save you some money too.